Eye On Sports Media: Photo Gallery: Pandemonium at Georgia Tech's Thrillerdome! Photo Gallery: Pandemonium at Georgia Tech's Thrillerdome! There was pandemonium in Georgia Tech's Thrillerdome (ala Alexander Memorial Coliseum) today as Tech (12-3, 1-1 ACC) did the unexpected. Coming off a loss to the University of Georgia (8-5, 0-0 SEC) earlier this week, the 17th-ranked Yellow Jackets upset 5th-ranked Duke today by a score of 71-67. Coming into the game, Duke had won 11 of the last 12 meetings at Alexander Memorial Coliseum. 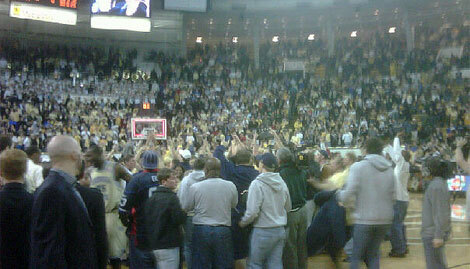 Georgia Tech Basketball Sports Information Director Mike Stamus was in the middle of the post-game celebration on the court, took this photo, and posted it to Facebook.